Do yourself a favour and dowload this FREE DVD. 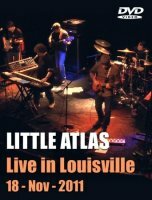 After three excellent albums released through the American prog-rock specialists 10t Records, Little Atlas and their label have teamed up to offer an ‘Official Live Bootleg’ DVD of the band’s November 2011 show in Louisville. Now the bootleg part of that title is important, as not only is this show not a professionally recorded DVD, but neither do the band, nor the label expect you to part with any cash for it. In fact both are actually encouraging you to download this DVD for free, make as many copies as you want and distribute it around your prog-minded friends! If you’ve never encountered this Charleston, South Carolina quartet (expanded to a quintet on stage) before, then prepare to be dazzled by their eclectic, yet seductive mix of Spock’s Beard, Echolyn, Izz, early Marillion and well, something just a little heavier, as they work their way through tracks from each of the their three albums (‘Surface Serene’ (2002), ‘Wanderlust’ (2005) and ‘Hollow’ (2007)), and an interesting little cover version. Due to the manner of the recording, the camera angles are limited to stage front and at times things can get a little shaky and zoom happy. However as the band (and camera man) settle in, so the action becomes slightly less frantic. What is never in question however is the music itself, with impressive bursts of guitar-keyboard interplay punctuating more subtle sections where vocalist/keyboard player Steve Katsikas shines, both through his subtle instrumentation and his striking, yet pleasingly simple vocals. Sometimes a crazed snarl or two is added to the mix, but beyond that Katsikas is a singer who likes to let the words tell a story, with his pitch perfect, but often quirky attack being captivating throughout. The guitar styles range from Steve Hackett like poise and precision to some really dirty riffs and while a sterling cover of the Genesis classic ‘Firth Of Fifth’ offers a glimpse of some of the Little Atlas influence list, more often than not, you are as likely to be struck by the muscularity of the music, as you are its beauty, even if things thankfully, never quite tumble over into prog-metal territory! Simply breathe in great songs like ‘Silence’, ‘Higher’, ‘Paranoiac’ and ‘The Ballad Of Eddie Wanderlust’ to experience the varied, yet amazingly skilled world in which Little Atlas reside. 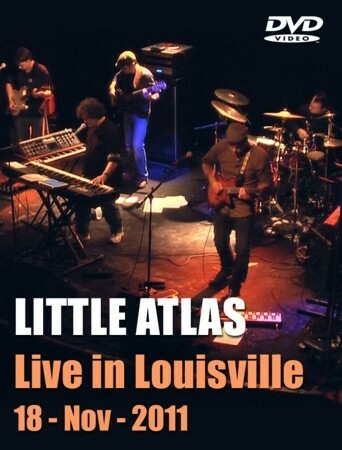 Currently in the studio working on their long awaited fourth album, Little Atlas is one of those bands that, despite their excellent music, remain a hidden pleasure. Do yourself a favour and follow this link for full instructions on how to go about downloading the full DVD. These instructions even explain how to burn the disc itself. Then wallow in a great show that relies purely on excellent music to keep you enthralled. Did I mention it is all FREE?! ?